The biggest obstacle to Syrian self-determination today is the Assad regime which increasingly rests on Russian bayonets drenched in Syrian blood. He is determined to stay in power by any means necessary and will not rest until their struggle for self-determination (which is what a democratic revolution is) is buried, in mass graves if need be. Respect for Syrian self-determination means respecting how Syrian revolutionaries organize their struggle and their choices even when they conflict with our own preferences and choices. If Syrian revolutionaries ask for Western airstrikes because they lack an air force to counter the Assad regime militarily, who are we to oppose those airstrikes? Who are we to tell them that all-out defeat is better than the triumph of a revolution “tainted” by an unavoidable compromise with imperialists powers? Who are we to tell them they must face Russian helicopter gunships without imperialist aid because “the revolution will be won by Syrians themselves or it won’t be won at all”? Do we really want our Syrian brothers and sisters to confront tanks with rocks and slingshots as so many Palestinians have? 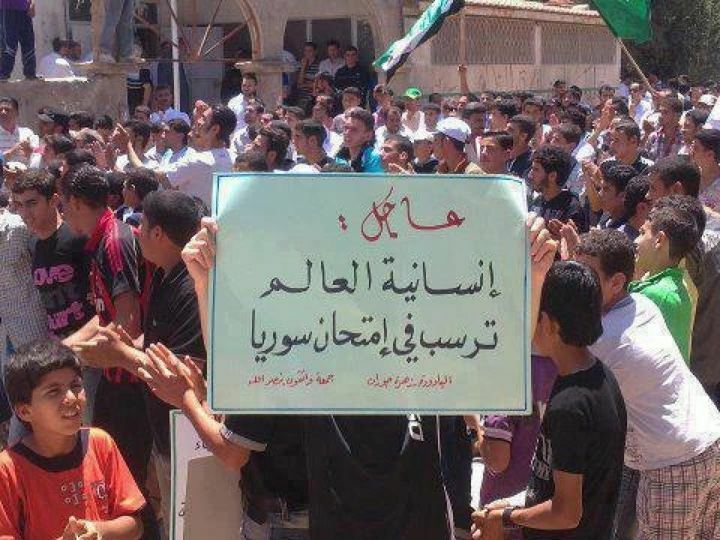 Banner from Idleb reads: to the Syrian opposition in Egypt: before splitting the cake, help us first to bake it! While the Western left is raising a hue and cry over the minimal aid Syria’s rebels receive from the CIA and reactionary Gulf states, Russia is overtly ramping up its military aid to Assad. Whether we like it or not, the struggle between the Syrian revolution and Assad’s counter-revolution has been internationalized just as the Spanish civil war of 1936-1939 was. The Western left in those days demanded foreign intervention in the form of arms, military aid, and volunteers for the Spanish Republic. The anti-interventionists (mostly fascists or fascist sympathizers) were more than happy to see the Republic starved in the name of “non-intervention” while Hitler bombed Guernica and did everything possible to ensure Franco’s victory. Those who oppose Western military action today against Assad in the context of a revolution that has developed into a full-blown civil war where segments of the revolution and the people are begging for foreign arms, aid, and airstrikes while the counter-revolution imports arms to slaughter them follow in the anti-interventionist footsteps of the Spanish Republic’s opponents whether they are aware of it or not. “Hands off Syria” should be the slogan raised at demonstrations in front of Russian embassies and consulates around the world, not the one directed at foreign powers aiding the rebels lest we become little better than Assad’s unwitting executioners in the eyes of revolutionary Syrians. Instead of focusing our fire on the shortcomings of the SNC, FSA, and the coordinating committees, we should be organizing events and fund-raisers for humanitarian relief, fact-finding missions, and video and communications equipment with the aim of smuggling it into Syria. These activities are already taking place but not with the participation of the Western left since we are more worried about our precious anti-imperialist principles and hypothetical Libya-style airstrikes (as if the outcome there was a step backward and not a step forward) than tackling the ugly realities of the Syrian revolution whose straits become more desperate with each passing hour. We fiddle furiously while Syria burns and Syrians bleed. The most important thing for the Western left to do is to forge close and enduring relationships with revolutionary Syrians living abroad by demonstrating our unequivocal support for their revolution through deeds, through joint work with their communities. Only in that context and on that basis can criticisms we have about deals with U.S. imperialism or mistakes made by the SNC, FSA, and the coordinating committees gain a hearing among the people who count: revolutionary Syrians. One way to begin building these relationships would be to organize forums and debates over the question of intervention with revolutionary Syrians of various shades of opinion. The single most embarrassing aspect of the Western left’s opposition to NATO’s Libya operation was the way revolutionary Libyans were barred from Libya forums organized by anti-interventionists. This outrage was the absurd but logical outcome of the white anti-imperialist’s burden, a burden we must cast aside if we hope to act in concert with the Arab Spring. The Western left should reject knee-jerk anti-imperialism because its unthinking, blind, reflexive, nature put us at odds with the interests and explicit demands of first the Libyan and now the Syrian revolutionary peoples and in line with the interests of their mortal enemies. Knee-jerk anti-imperialism leads to our enemies doing our thinking for us: whatever Uncle Sam wants, we oppose; whatever Uncle Sam opposes, we want. 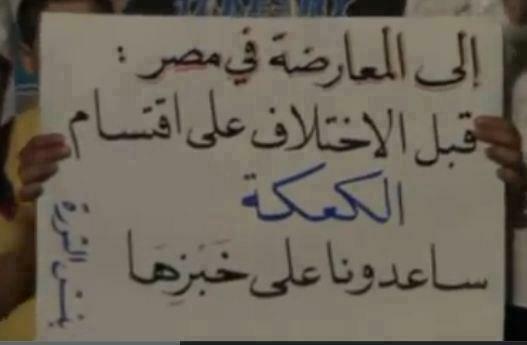 This method plays right into U.S. imperialism’s hands because the last thing Uncle Sam wants is a thinking enemy. Thanks for reposting part of this. I am glad you like it!